As a teacher, I firmly believe that students can learn anything. This applies to academics, character, and…helping you around your classroom! 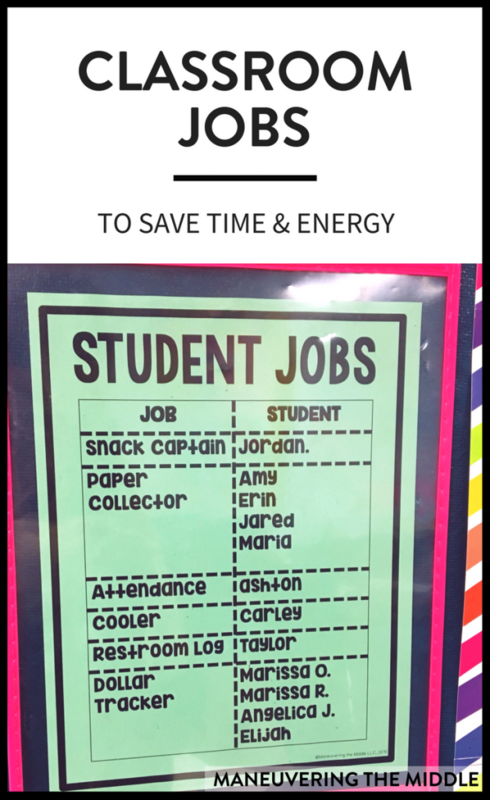 Today I am sharing some practical tips on how to set up students to help you with various tasks and classroom jobs for which you can enlist the help of your middle school students. There are two buckets of classroom jobs in my mind. 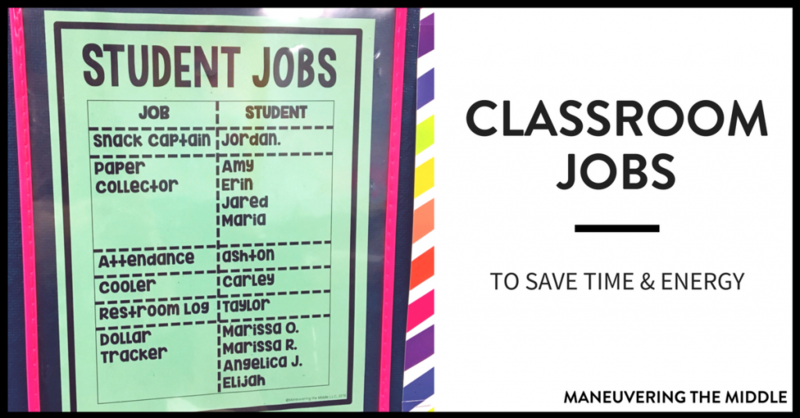 There are classroom jobs that are happening every day that make a classroom function. I have a student who is responsible for signing out students who go to the restroom, I have a student who takes attendance for me, I have a table captain who is responsible for stacking their table group’s papers, and I have a materials manager who is responsible for picking up manipulatives and putting them away. The other type of classrooms job I have is the catchall of anything that I don’t want to spend my time doing but a student** would love to do! This includes putting student work on bulletin boards, putting stickers on mastery trackers, or organizing and plugging in technology. Other not-so-official jobs include: fill up my water bottle, throw this trash away for me, go get my whistle, go put my jacket back in my classroom because it is hotter than I thought it was, and go tell so and so to hurry up in the bathroom. Ha! If you are a little controlling and want perfection each time, you will have trouble giving jobs to students. The opportunity cost is that you get some time and energy back to devote to other tasks, but the risk is that your bulletin board letters could be off center and that you end up redoing it because it drives you crazy. Decide what jobs can be done by students that if they aren’t perfect or end up being messed up it doesn’t impact you or your classroom too much. Teacher Task or Student Job? A great way to decide whether a job should be yours or should be given to a student is to ask yourself: In the time that I could explain how to do this and answer any questions, could I have finished it myself? Or what are the consequences if this job is done completely wrong? One time, I had a teacher’s aid cut out squares for a matching activity that I needed for the next day. I told her that she had to be methodical about how she cut and organized because the sets couldn’t be mixed up. This student was in high school, so I walked away thinking how I would get to go home early. BIG MISTAKE! I should have monitored or at least had her repeat my instructions back. What is worse is that I didn’t realize that she mixed all the sets up until my first class tried unsuccessfully to use them. I then had to come up with something new on the fly! On the other hand, if you can train one or two students to complete a job that needs to be done on a regular basis throughout the entire year, do it! For example, I use the same two students to update my payday tracker. They know what each color means, and they save me around 10 minutes per week. These lovely students come in at lunch, know where to find the information, and they are done by the end of a lunch. Students LOVE helping teachers. “Who can help me with …” is usually met with a raised hand from even the most apathetic students. Student jobs are seen as rewards rather than a chore. What student jobs do you have in your classroom? **When I am referring to students, I do not mean every single student that you teach. I am referring to a select few that finish their work early or are so eager to help that they would eat lunch in your classroom.